The first Williamsburg Starbucks at 405 Union Ave.
WILLIAMSBURG — Another Starbucks may open in the neighborhood, this time with booze. 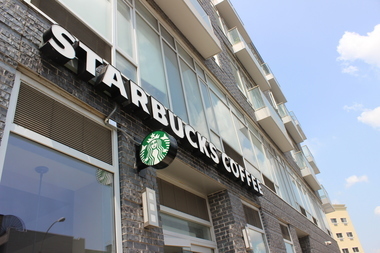 Coffee House Holdings, Inc., doing business as Starbucks, is asking Community Board 1's approval for a beer and wine liquor license for 154 N. Seventh St., according to Community Board 1's agenda for an August public meeting. The Seattle-based chain has applied for liquor licenses as Coffee House Holdings before in New York, for a business called Herald Square Cafe, 151 W. 35th St. The Herald Square Cafe in Macy's is a "stealth" version of the ubiquitous coffee shop that doesn't use the Starbucks name, one of many non-Starbucks branded shops intended to have "a community personality," according to the Seattle Times. A Starbucks spokeswoman did not immediately have a comment. A spokesman with the State Liquor Authority said it had not yet received an application. Under state law, businesses cannot file an application until 30 days after notifying the community board, he said. The community board's vote is advisory to the SLA, which makes the final decision. Earlier this week, Starbucks opened its first Williamsburg location at 405-409 Union Ave., with some deriding its presence in a neighborhood with a culture of small businesses. But while some felt "weird" about buying coffee from the company, the shop was not without its supporters, who cited convenience and love of the espresso for stopping in.